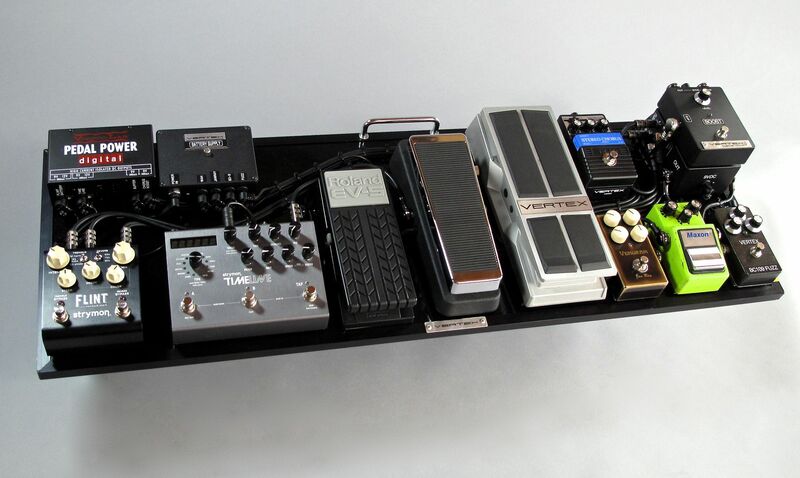 Vertex Tri-Buffer (single input buffer and dual output buffer), effects "break-out" to insert pedals off of the pedalboard between the distortion pedals and modulation pedals, and a polarity switch and isolation transformer on the right output for a stereo amplifier set-up. Both L and R outputs sum to MONO when the system is run out of the L out only. *Vertex BC109 Fuzz, Maxon SD-9, Jan Ray Boost, and Vertex Axis Wah are all powered by the Vertex Battery Supply. *Roland EV-5 EXP is paired with the Strymon Timeline.